This Hanukkah, you’ll want to gather around the table with your family to light the menorah. While you want there to be flickering flames, what you definitely do not want is a melted candelabrum melting all over your holiday decor. Target is making sure consumers who might not have noticed when it recalled the Menorahs in May are paying attention now, when shoppers are looking for holiday products or pulling out products they bought in warmer months, and is reissuing its recall of about 2,600 clear acrylic menorahs. The candlesticks can melt when the candles are lit, posing a fire hazard, which is the exact opposite of a warm, glowing family moment. The menorahs are in a pyramid design that are 10.5 inches long, 1.2 inches wide, and 2.3 inches high. The menorahs were sold at Target stores nationwide from Oct. 2015 through Dec. 2015 for around $20. 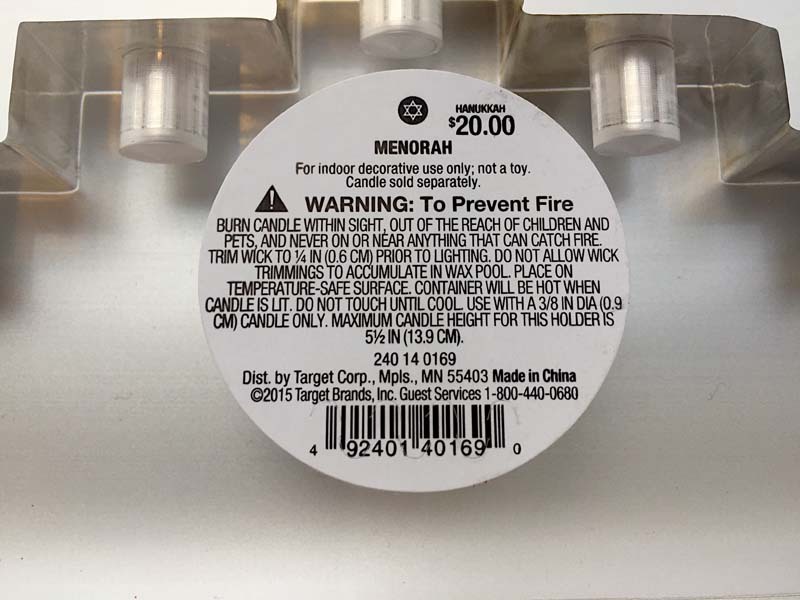 Check the round white label on the side of the menorah for model number 240-14-0169 and the bar code. Thus far, Target has received eight reports of the product melting, including three reports of fire. No property damage or injuries have been reported. If you own one of these meltable menorahs, don’t use it — return it immediately to Target for a full refund. Customers can reach Target at 800-440-0680 from 7 a.m. to 6 p.m. CT daily, or online at www.target.com. Next Philip Morris Applies To Bring Heated-Up Tobacco Sticks To U.S.
Next Up: Philip Morris Applies To Bring Heated-Up Tobacco Sticks To U.S.